Will Doug Pederson Play the Eagles Starters in the Regular Season Finale Despite Clinching Home Field? With the No.1 seed in the NFC secured after the Eagles clawed their way to a win over the Raiders Christmas night, head coach Doug Pederson will decide by Wednesday whether to risk his starters in the team’s Week 17 game against the Dallas Cowboys according to Mike Florio of ProFootballTalk.com. Week 17 is always a delicate balancing act for playoff coaches to negotiate, as teams want to keep their momentum and winning attitude going and put on a good show for their paying fans but do not want to risk injury in a meaningless game. Judging from his dismal performance against the Raiders, quarterback Nick Foles could definitely use the reps with his offensive skills players after holding a clipboard for most of the season. If Foles plays against the Dallas Cowboys next week and gets hurt, however, fans and ownership might never forgive Pederson for blowing the team’s best chance of playing in the Super Bowl in years. Pederson point out that he may have no choice but to play Foles next week. 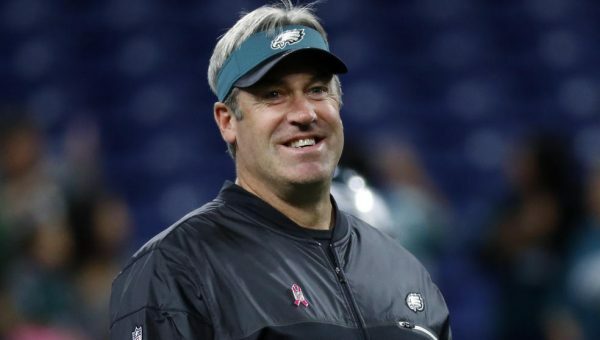 “Right now with only two guys [at quarterback], I would assume he’d probably have to play some,” Pederson said. Beyond keeping his starters healthy, Pederson needs to worry about them being rested to the point of rusty. Having secured a first-round bye, the Eagles will go three weeks between meaningful games. And they’ll be facing a team that will have just won a potentially hard-fought wild-card win. And they’ll be carrying the weight of expectations that comes with being the No. 1 seed. It’s a problem that every other team in the NFC would love to be dealing with right now.